The Purdue University Institute for Plant Sciences is devoted to preparing students for a high-tech science careers in all facets of the agriculture industry. Part of that mission comes to life in two new collaborative, state-of-the-art teaching labs where students can interact with the types of research and technology they’ll encounter in the field. The newly renovated lab in the Biochemistry building, rooms 112 and 113, transform a typical wet lab into an interactive lab with cutting-edge research equipment and computational tools to teach modern analytical research procedures. “We are able to expose students to a real, authentic lab and research setting using modern equipment they would actually see and use out in the real world,” said Mark Hall, Ph.D. and associate professor of biochemistry. Each student is equipped with a Microsoft Surface Pro 3 tablet with a wireless presentation system that allows any active group of students to display their work on one of three large, flat screen displays. This enables the instructor to present lecture material while students are actually working on lecture material at their station. 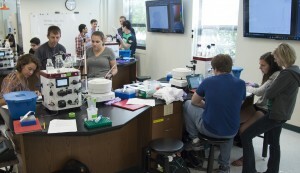 Focusing on genetics, the new Beck’s Genetics Lab in Lilly Hall of Life Sciences can now accommodate twice the number of students in each lab section of AGRY 321 each semester. 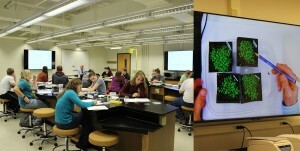 This state-of-the-art learning facility is funded by the Beck Family of Beck’s Hybrids and a donor match made by the Purdue Institute for Plant Sciences. 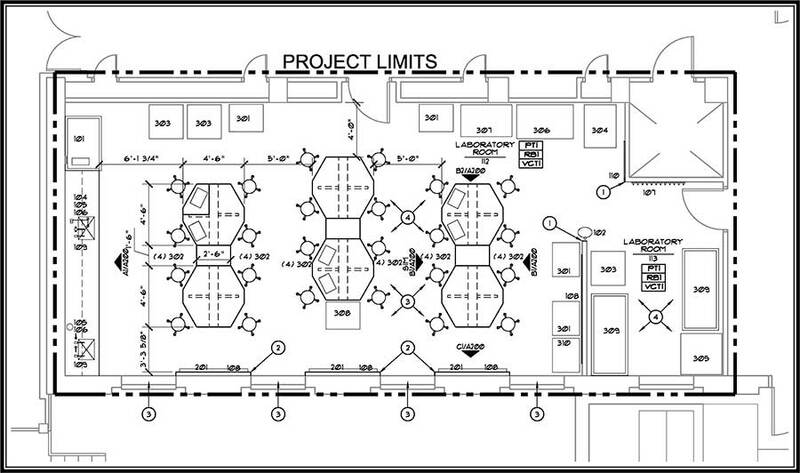 The lab also includes an adjacent preparation room and updated neighboring Crops Resource room. Benches are designed in such a way that four students can sit around each bench and work as a group. An inverted microscope connects to three large monitors to display a detailed analysis of cross section of tissues, cell division, and/or chromosomes. Gregore Koliantz, Ph.D. and continuing lecturer, recognizes great opportunities for students and faculty. “The faculty have exceptional opportunity to use the facilities and students who take my course will enjoy excellent learning opportunities that may encourage them to pursue genetics as their future career,” said Koliantz.